Dear Reader, this joke is so wrong in so many ways and on so many levels that it is one of my favourites of all Invisibule comics so far. There, I have a twisted sense of humour, and I don’t care who knows it. I’ve often wondered if the problem of choosing a material to make jars for vanishing cream is analogous to the problem of choosing containers for super-glue. 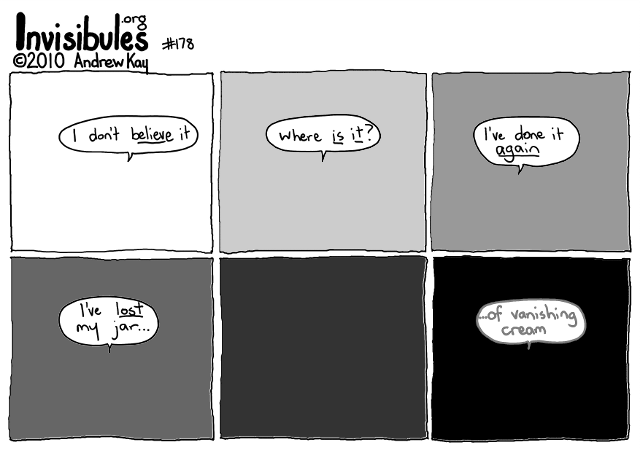 I don’t think you have any proof you ever had vanishing cream in the first place. … so just where do you suppose all those Higgs particles are hiding, then?